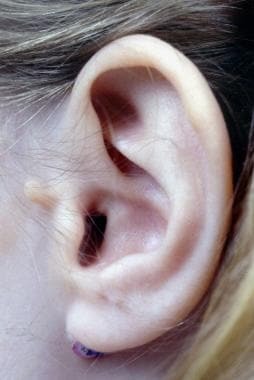 Close-up image of preauricular pit. Image courtesy of Ed Porubsky, MD. 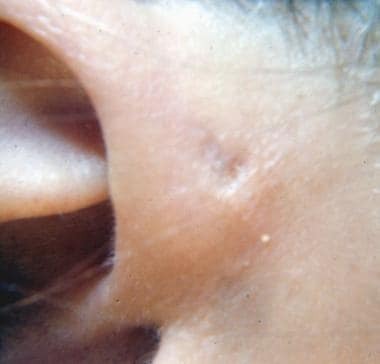 Preauricular tags, as shown below, are epithelial mounds or pedunculated skin that arise near the front of the ear around the tragus. 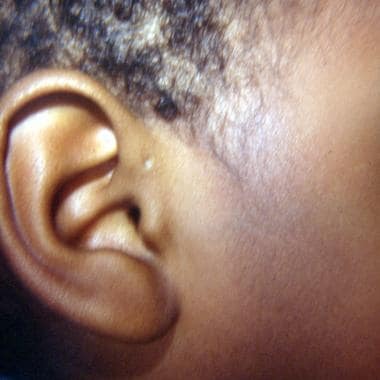 They have no bony, cartilaginous, or cystic components and do not communicate to the ear canal or middle ear. With regard to laboratory studies, culture samples may be obtained during drainage procedures. Imaging is not indicated for routine preauricular cysts and sinuses. 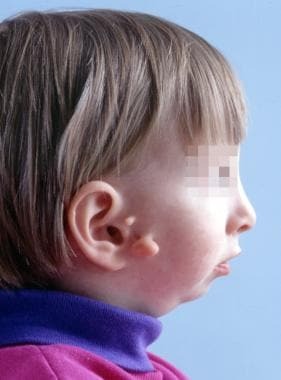 However, it is indicated in patients who present with pits or fistulas located in atypical regions, those with cartilage duplication around the external auditory canal that extends into the parotid, and those with recurrent parotid swelling. Patients who have preauricular cysts or pits and a branchial cleft cyst should undergo renal ultrasonography to rule out branchio-oto-renal syndrome. Incision and drainage procedures may be required for patients with abscess formation. Staphylococcus aureus is the most common bacteria found in these infections, followed by Proteus, Streptococcus, and Peptococcus species. The authors discourage standard incision and drainage in the setting of abscess formation within a preauricular sinus tract or cyst. A potential alternative to incision and drainage is the use of a blunt-ended lacrimal probe inserted into the preauricular pit in order to open the abscess cavity. However, acute inflammation usually makes this option technically difficult and painful. Aspiration with a 21-gauge needle reliably provides at least temporary relief, eases pain, and provides purulent material for culture and sensitivity. Needle aspiration may need to be repeated if an abscess reaccumulates, but this procedure reliably leads to a better cosmetic result than incision and drainage. Complete surgical excision of a preauricular sinus tract or cyst is indicated in the setting of recurrent or persistent infection. The operation is typically performed when the acute infection has subsided. Recurrence rates following excision range from 0-42%. Factors that reportedly reduce the risk of recurrence include complete excision of the sinus and tract with associated perichondrium, dissection down to temporalis fascia, closure of dead space, and avoidance of sinus rupture. An SY, Choi HG, Lee JS, Kim JH, Yoo SW, Park B. Analysis of incidence and genetic predisposition of preauricular sinus. Int J Pediatr Otorhinolaryngol. 2014 Dec. 78 (12):2255-7. [Medline]. Lee KY, Woo SY, Kim SW, Yang JE, Cho YS. The prevalence of preauricular sinus and associated factors in a nationwide population-based survey of South Korea. Otol Neurotol. 2014 Dec. 35 (10):1835-8. [Medline]. Zou F, Peng Y, Wang X, et al. A locus for congenital preauricular fistula maps to chromosome 8q11.1-q13.3. J Hum Genet. 2003. 48(3):155-8. [Medline]. Beleza-Meireles A, Hart R, Clayton-Smith J, et al. Oculo-auriculo-vertebral spectrum: Clinical and molecular analysis of 51 patients. Eur J Med Genet. 2015 Sep. 58 (9):455-65. [Medline]. Andersen SL, Olsen J, Wu CS, et al. Severity of Birth Defects After Propylthiouracil Exposure in Early Pregnancy. Thyroid. 2014 Jun 25. [Medline]. Scheinfeld NS, Silverberg NB, Weinberg JM, Nozad V. The preauricular sinus: a review of its clinical presentation, treatment, and associations. Pediatr Dermatol. 2004 May-Jun. 21(3):191-6. [Medline]. Wu GT, Devine C, Xu A, Geelan-Hansen K, Anne S. Is routine audiometric testing necessary for children with isolated preauricular lesions?. Int J Pediatr Otorhinolaryngol. 2017 Feb. 93:68-70. [Medline]. El-Anwar MW, ElAassar AS. Supra-auricular versus Sinusectomy Approaches for Preauricular Sinuses. Int Arch Otorhinolaryngol. 2016 Oct. 20 (4):390-393. [Medline]. [Full Text]. Coatesworth AP, Patmore H, Jose J. Management of an infected preauricular sinus, using a lacrimal probe. J Laryngol Otol. 2003 Dec. 117(12):983-4. [Medline]. Firat Y, Sireci S, Yakinci C, et al. Isolated preauricular pits and tags: is it necessary to investigate renal abnormalities and hearing impairment?. Eur Arch Otorhinolaryngol. 2008 Sep. 265(9):1057-60. [Medline]. Tan T, Constantinides H, Mitchell TE. The preauricular sinus: A review of its aetiology, clinical presentation and management. Int J Pediatr Otorhinolaryngol. 2005 Nov. 69(11):1469-74. [Medline]. Rataiczak H, Lavin J, Levy M, Bedwell J, Preciado D, Reilly BK. Association of Recurrence of Infected Congenital Preauricular Cysts Following Incision and Drainage vs Fine-Needle Aspiration or Antibiotic Treatment: A Retrospective Review of Treatment Options. JAMA Otolaryngol Head Neck Surg. 2017 Feb 1. 143 (2):131-4. [Medline]. Choo OS, Kim T, Jang JH, Choung YH. The clinical efficacy of early intervention for infected preauricular sinus. Int J Pediatr Otorhinolaryngol. 2017 Apr. 95:45-50. [Medline]. A preauricular sinus tract is probed with a blunt needle, and methylene blue dye is injected. Note the region in front of the pit, where previous abscess formation, spontaneous drainage, and residual scarring and granulation have occurred. This circumstance requires a more complex procedure. Removal of the entire sinus tract and the granulation disease is essential. Image courtesy of Ed Porubsky, MD. Preauricular sinus tract, cyst, and granulation removed. The skin was closed with slight undermining and no tension. Sutures are removed 7-10 days later. 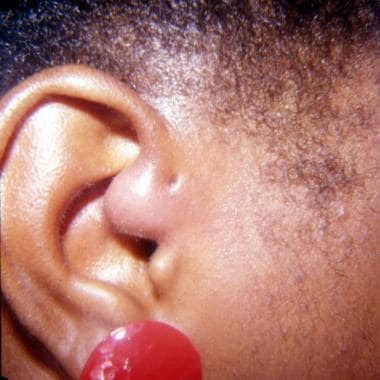 Keloid scar formed several months after removal of preauricular sinus tract. Intralesional steroids and close observation are indicated.